For a small investment of time and money, this course will familiarize you with our 3D Coaching training. Upon completion, you will have the opportunity to continue your 3D Coaching journey by applying the full retail price of this course ($20.00) towards the registration fee of our full Course for Certification and/or College Credit. Great course! Very concise and practical. Excellent overview of the 3D process. This is something that everyone parent should consider taking. It was great to view the essentials and be able to see and hear some of the things I am doing in the 2nd and 3rd dimension but also what I can do to further improve my coaching in these two dimensions. This course was great! I enjoyed all of the real situation stories. It helped relate to all of the information being given. this course was very enlightening. Easy to follow gets right to the point short videos. I thought the information was very informative and the site and coursework easy to use. Clear and concise training on how to create a high performing team and transform lives in the process! Great listening and getting an overview of how I can become a better coach and leader. It was a good course. My other profession outside of coaching is nursing. In nursing, we focus on the holistic (whole being) approach to healthcare. Much like nursing, coaching is about seeing the whole individual and helping to make them better each day. 3-dimensional coaching explores deeper into the art of coaching which is what I believe more coaches need in order to develop a deeper understanding of what it means to be successful. very well done. Great ideas and different thinks to think about while coaching. I like the strategies that were given. This will help me as a coach, teacher, and parent. I have enjoyed it very much. I believe the info is impactful and really enjoy the short length of the videos, and I can watch them as I get time. I am a Chaplain at the largest school in Georgia, also have a week long summer camp for less fortunate children, and work full time in business development. These courses help me in every aspect and I can't wait to learn more so I can teach this to others! This course is a great start into the 3D philosophy. It has started to change the way I see my duty in front of young athletes. Awesome reminders and education for me both as a parent and coach. So many easy, little takeaways to implement in your program. I can’t wait to get going this Fall. Very thought provoking. I will use these points going forward to become a better coach for my athletes. I enjoyed learning more about the three dimensions. This course covers the basics of our 3Dimensional Coaching training. After you receive a basic introduction/overview, you will learn the “essentials” about the 1st, 2nd, and 3rd Dimensions along with numerous practical Level 2 & 3 coaching strategies that can be implemented immediately. 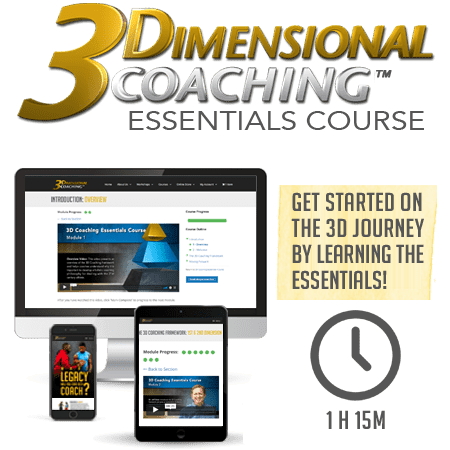 Will I receive my 3D Coaching Certification by completing this course? How long does this course take to complete? You can work entirely at your own pace, but the course will take a minimum of 75 minutes to complete the video teachings. Can I start and stop the training without losing my progress? Yes. Each module takes an average of 5 minutes to complete. Once you mark a module complete, your progress will be saved and you can resume from that point if you decide to finish the training later. I’m an administrator and I want ALL of my coaches to be trained in the Essentials Course. How do I get them enrolled? Simply contact us and let us know how many licenses you would like to purchase. We will set up a unique code that will allow your coaches to enroll in the course at no cost to them. We will then send you an invoice, and you can pay for them all at once out of your athletic budget, professional development budget, or with donated funds from sponsors. As an administrator, we will give you access to monitor their progress. Does the Companion Study Guide coincide with the 3D Coaching Essentials Course? No. The Companion Study Guide only corresponds to our full Course for Certification and/or College Credit.